A30 / A30HP / A40HP: What makes them different? The A30 Model features a simple "gear-type" hydraulic pump. 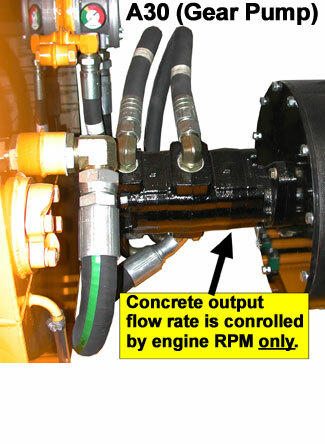 Increasing engine RPMs increases the flow of oil, which increases concrete output. Decreasing RPMs reduces the flow of oil, which decreases concrete output. The minimum concrete output the A30 can attain by slowing down the engine's RPMs is 5 cubic yards per hour (3.8 cubic meters per hour). The A30HP and A40HP Models feature a "variable displacement-type" hydraulic pump. As with the A30 "gear pump", increasing engine RPMs increases the flow of oil, which increases concrete output and vice versa. 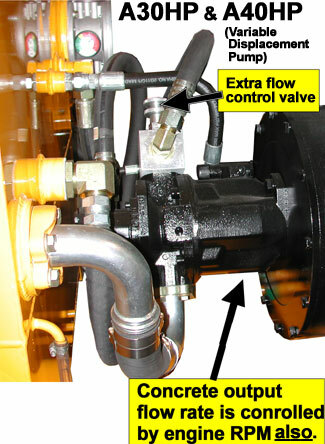 The "variable displacement pump" ALSO offers a "flow control valve". With a simple twist of this valve, the output can vary from zero to maximum even while keeping the engine's RPMs constant. When to buy an A30, A30HP, A40HP? Certain precision concrete applications require very low output levels. (Long-distance blockfill, for example). Since the A30 gear pump can only slow down output to a minimum of 5 cubic yards per hour (3.8 cubic meters per hour), the A30HP Model or A40HP Model is preferred for those applications. Many pumpers will never need output below 5 cubic yards per hour. For them, any of the A Series Pumps will be a good choice. The A40HP Model is the the highest performance A Series "Rockmaster" Pump. It is rated at 40 cubic yards per hour (31 cubic meters per hour), versus 30 cubic yards per hour (23 cubic meters per hour) with the A30 or A30HP. The A40HP also offers the highest concrete pressure in the A Series (1172 psi, 82 bar). This high concrete pressure allows the A40HP to pump higher, further, and faster than the A30 and A30HP (903 psi (62 bar)).